Students will be able to recognise the names of zoo animals and identify some of their dietary habits. Make preparations for a field trip to the zoo. Make sure to obtain all necessary permissions. Before the field trip, let your students know that they should pay close attention to the animal habitats—they'll be making a zoo animal scrapbook once they return. Remind them that, for the duration of the trip, they need to observe the animals and write and/or draw their observations in their notebooks. Get your students engaged by asking them a "hook" question before entering the zoo. An example is: How do you get your food?Chances are that most students will answer with "From Mom and Dad" or "From the supermarket." Tell the class that Zoo animals, animals that can be found both in zoos and in the wild, get their food in similar ways. Baby animals get their food from their parents, while parents have to find food. The different surroundings and abilities of each animal likewise affect what it eats and how it obtains it. Explain to the students that they'll be observing animals in their habitats in order to discover the animals' diets and eating habits. Let them know that they can record as many observations as they like. Go to the zoo! If you don't have access to a zoo, plan a "virtual field trip" and show your class images and videos of animals that are typically found at the zoo. During the field trip, take pictures of each animal. Discuss the animals' diets with your students. 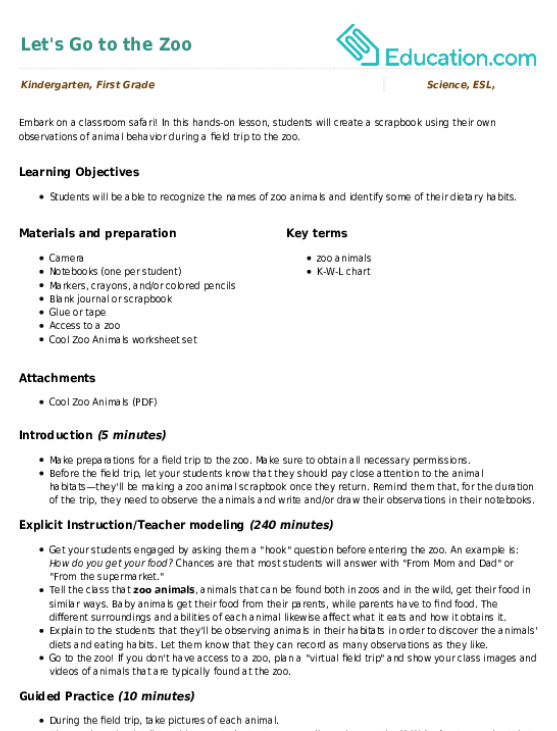 Base your discussions on the K-W-L chart, or a chart that outlines What We KNow, What We WAnt to Know, and What We LEarned, to assess prior knowledge and determine topics of interest. For example, a student may KNow that Lions eat meat,WAnt to know What lions eat, and by the end of the day has LEarned that Lions at the zoo eat chicken, pork, and beef. However, lions in the wild eat antelopes, wildebeests, baby elephants, and even crocodiles. Once you and the students are back in the classroom, assemble the pictures you took. If you used a digital camera, upload the pictures, print them out, then paste them into your blank journal or scrapbook. If you used an instant camera, paste the pictures directly. Have students write down things they've learned about each animal under that animal's picture. Ask them to decorate empty space with illustrations like the ones they made in their notebooks. Enrichment:An advanced classroom may enjoy making a digital scrapbook instead. If I Ran the ZooBy Dr. Seuss could be added to their lesson as a closing supplement. Support:If making a scrapbook seems too complicated for your students, you can have them colour pages from the from the Cool Zoo Animals set. Ask each student for her favorite page from the set, then print out that page for her. Ask the class enriching questions about zoo animals throughout the activity. Some questions you can ask are: What do you think this animal eats? How fast does this animal look? Good Night, GorillaCould be added to their lesson as a closing supplement. Pictures taken with a digital camera can be assembled into a digital scrapbook using a computer. Ask students about about their favorite animals. Some questions you can ask are: Why is that animal your favorite? What are some of its eating habits? What are some of its living habits? Allow students to share some of the things they learned about zoo animals during today's trip. 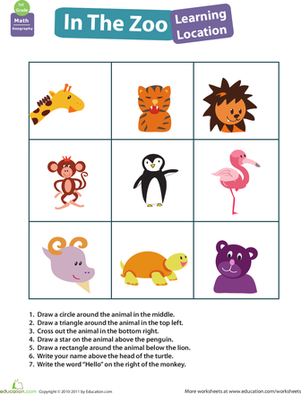 Name the characteristics and/or habits of different zoo animals, and have the students guess which animal you're talking about. In this hands-on lesson, students will create a scrapbook using their own observations of animal behaviour during a field trip to the zoo. 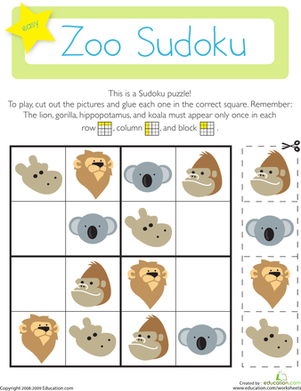 Help your early reader learn all about nouns with this fun worksheet about visiting the zoo! After reading a story about the zoo, students will follow directions to circle conjunctions, possessive pronouns, and articles with a colour. 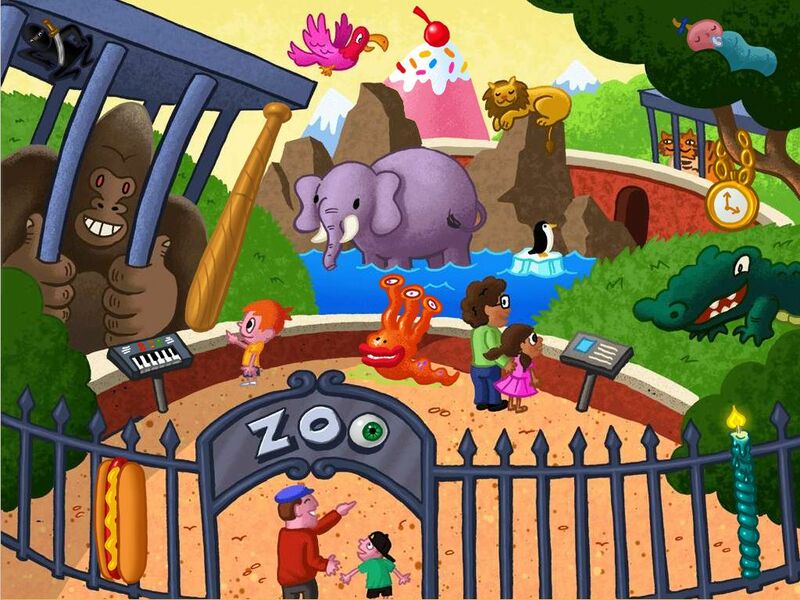 Your kid will examine this zoo scene and find all the objects that don't belong. Get your first grader to answer some important questions about the zoo animals' locations to test her knowledge of important prepositions. 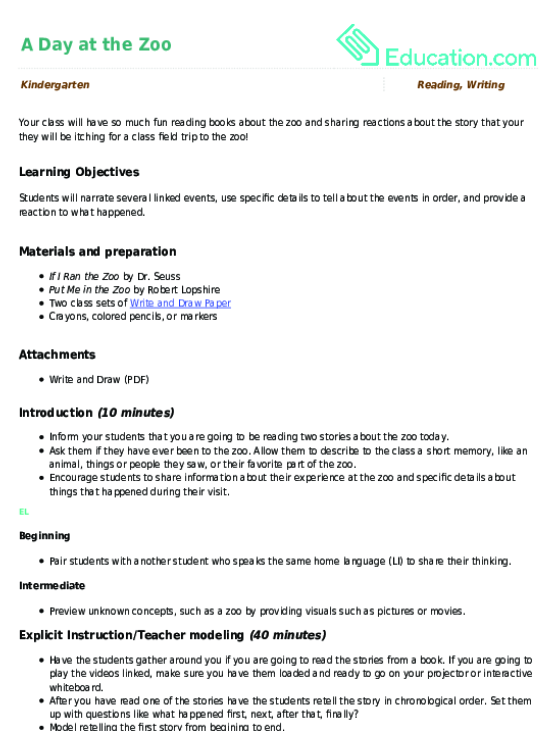 Use this glossary with the EL Support Lesson: Put Me in the Zoo. Engage in a fun connect-the-dots activity while practising counting by six!